How to get married in New York City is a common question for our affordable NYC wedding planners at NY1 Minute. We strongly encourage you use our build-your-own elopement or wedding package! You can choose to have your wedding at NY City Hall or another location in NYC. A NYC City Hall wedding ceremony actually takes place at 141 Worth Street at the “Office of the City Clerk, Marriage Bureau”. Locals say “getting married at City Hall” because it is right next to the NYC City Hall in downtown Manhattan. The marriage bureau has two well-appointed wedding chapels. All couples, regardless of gender or sexuality can get married in NYC. Learn how to get married in New York City with NY1 Minute in a few easy steps. Get your New York marriage license at the marriage bureau at 141 Worth Street during normal business hours M-F 8:30-3:45 p.m. The two of you must go together, in-person with your valid photo ID’s. Bring a money order made payable to the City Clerk or credit/debit card to pay the $35 marriage license fee. Hint: You can actually start the application on-line and then finish it in person to save time. Help: If you feel nervous about the process, book our Concierge Service. We walk you through this process start to finish. We promise to make your NYC wedding day fun and celebratory. Important: You must list all previous marriages. Provide your former spouse’s name, the date the divorce was granted, and the location where you received the divorce (city, state, and country). Please have this information on hand in order to get your NY marriage license. Second Step for how to get married in New York City: We have our NY marriage license. How can we get married in New York? In New York State, you must wait for 24 hours to get married unless you obtain in “Judicial Waiver” that allows you to get married on the same day. With our Concierge service, we walk you through that. Once you wait the mandatory 24 hours, you can get married anywhere in New York State with a registered NYS marriage officiant. Some people decide that after going to 141 Worth Street for their marriage license, they want to be married somewhere else. Perhaps, you need something more private or something outside of normal business hours. Whatever the reason, NY 1 Minute provides customized NYC wedding ceremonies at a very affordable price. We give you the option of having your wedding anywhere in New York and at a time that works for you. Therefore, have your NYC evening or weekend wedding and skip the City Hall line! 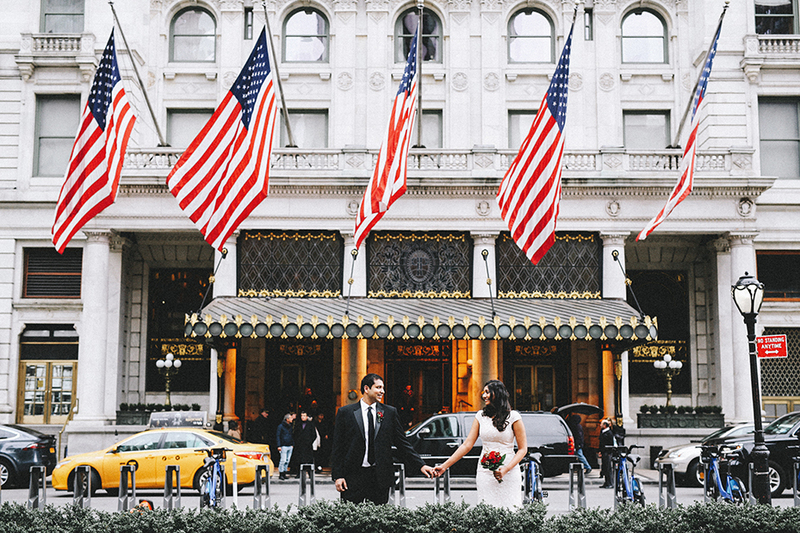 Book our all-inclusive NYC wedding package or build your own and choose only the services you need. HINT: You need a wedding witness that is not the officiant! Because our wedding photographers are wedding witnesses, you can be sure to have one at no extra cost. Finally: Get married at New York City Hall or somewhere else! The NYC City Hall wedding ceremony at the marriage bureau quick and easy! Twenty-four hours after you get your marriage license, you return to the same office at 141 Worth Street. You could decide to marry at another location which is a great option if you are looking for privacy and beauty!. We suggest considering a free or low-cost venue like Central Park. When you arrive, sign in, and wait for your number to be called. You cannot reserve or schedule your ceremony there. The fee to get married is $25 and is payable by credit/debit card or a money order payable to The City Clerk. The wait time to get married varies depending on how busy City Hall is that day. After your civil ceremony, you receive your certificate of marriage. Let the celebration of your life together begin! Need more flexibility in time and location of your wedding ceremony? Use our build-your-own package. Start your wedding planning today! Document your NYC City Hall wedding with beautiful photos and videos, book your services with NY 1 Minute Weddings. We offer the best in NYC elopement and wedding photography, videography and fully customized services.